Not a Person or Citizen: Are you a U.S. Citizen or Not ?!? I then ask, "can you be a Citizen of Wal-Mart or Microsoft "? which of course they say NO, but then some try to say, well this is a country... which my response to that is, not by definition it is not! The united States of America was a nation set up as a republic, but will find out that all changed in 1933 and it is now a corporation. 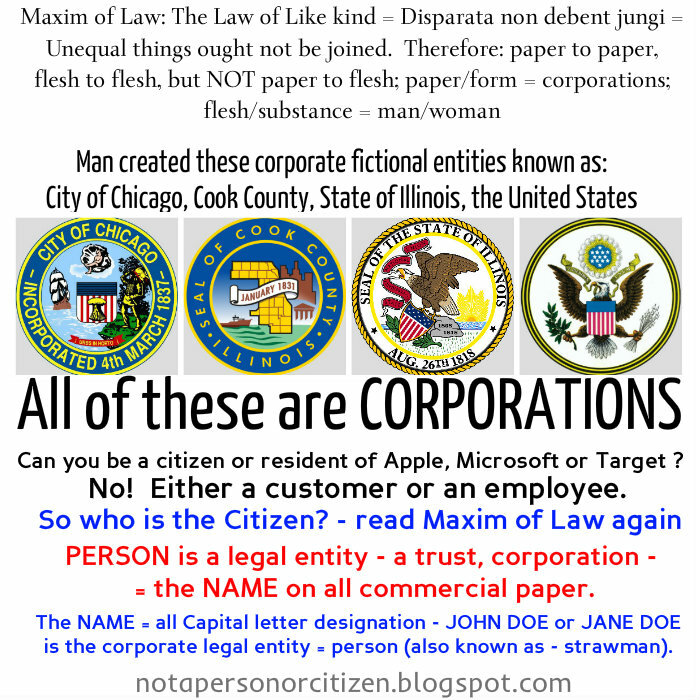 The UNITED STATES CODE (USC) is the UNITED STATES corporation’s governing code, period. Some people will attempt to say that they are citizens of the "California" (insert any State here) Republic. Okay, but there is no longer a Republic, anywhere, any more! People need to start reading and understanding how attorneys/ lawyers have altered the meaning of some common every day words to serve the corporate interests. Some may call it legalese, and of course that is what it is, however this has all been cloaked on purpose. 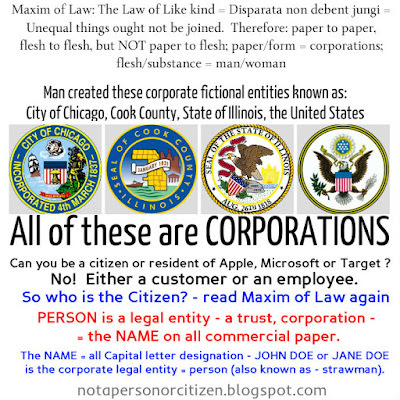 The attorneys, serving their masters, the international banking cartel or “banksters”, used legal trickery to form these non-existent legal entities -- cities, counties, states, supposed federal governments, and in doing so, have created a monster big brother police state corporation. Yes indeed boys & girls, the STATES are not sovereign as some people think, they are all under the big corporate umbrella -- UNITED STATES -- and interestingly enough, this happened in 1933 as well. 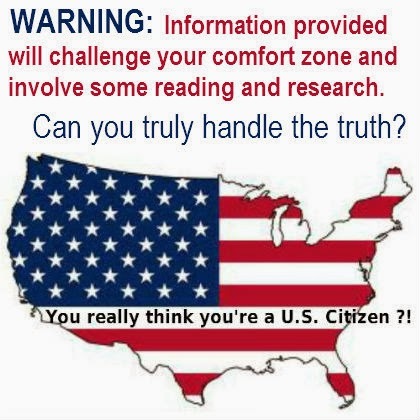 www.csg.org and go research the U.S. Code ! In 1933, the government was incorporated, or commercialized. To Commercialize means to "EXPLOIT." Therein lies the reason why "THE ATTORNEYS", changed this conventional government to a legal fiction. This was to exploit with words, and done so by the very men or women that hide behind the names or words. It is not the businessmen, no matter how big, who run our economic world. Again it is the lawyers, the lawyers who “advise” and direct every time a company is formed, every time a bond or a share of stock is issued, almost every time material is to be bought or goods to be sold, every time a deal is made. The whole elaborate structure of industry and finance is a lawyer-made house. We all live in it, but the lawyers run it. And in our private lives, we cannot buy a home or rent an apartment, we cannot get married or try to get divorced, we cannot die and leave our property to our children without calling on the lawyers to guide us. To guide us, incidentally, through a maze of confusing gestures and formalities that lawyers have created. Let’s put this real simply, someone nearly has to look at a city’s police car to find out who they (the police officers) are truly “protecting and serving”. 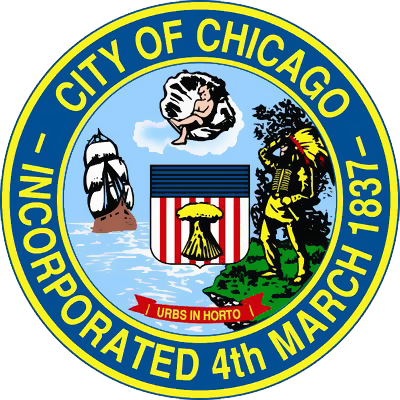 For example, in the city known as Chicago, it is clearly displayed on the car, “City of Chicago, Incorporated 1837” along with it’s corporate seal. 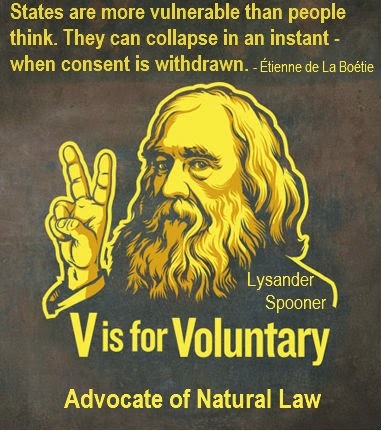 Now I realize that all societies need order and a set of laws, which is why I’m an advocate of private administrative remedy myself and courts of equity. If you don’t know what that is, please go look it up. To get an idea how whacky this corporation driven system has become, people who are working for these corporations after a while realize that there is indeed some thing terribly wrong, but most just keep their mouths shut, because it is job security and they say “hey, I am just doing my job”. Getting back to the example of common law – how can a man or a woman injure a fictional entity, non-existent corporation? They cannot, it is impossible. Marc: Am I entitled to a fair trial/hearing? Marc: Could I get a fair trial/hearing if there is a conflict of interest? Judge: No, you could not. Marc: If there was a conflict of interest, would you recuse yourself? Marc: Who do you represent? Marc: If you represent the state, and the state is the plaintiff, then you represent a party (in this case), isn’t that a conflict of interest? Lastly, in the movie "The Interpreter" (starring Nicole Kidman & Sean Penn), this line shines a light on truth that's often revealed in movies, yet people just don't see or hear it for what it's sharing: "Despite all the flags on First Avenue, there are no nations any more, only companies - international companies. lt's where we are. lt's what we are". - Kuman-Kuman to Slyva Broome in reference to the United Nation on First Avenue at 46th St. in New York.. ... incidentally, the tagline for the film: The truth needs no translation. care to come over here and tell the guys what I have been telling them for nearly two years now? https://youtu.be/gBmd4giPIXU - Things that are alike, are not the same. United States v united States of America.